Private letters from foreign governments to President Vladimir Putin usually go into the Secret box. Applications by foreign governments for large-value arms deals from the Russian state exporter, Rosoboronexport, usually go to the Security Council of the Russian Federation for review, and there they are kept in the Top Secret box. The Council, chaired by Putin, includes his chief of staff, Sergei Ivanov; the heads of the intelligence and security agencies; the Minister of Defense Sergei Shoigu, the Foreign Minister Sergei Lavrov, and others. Nikolai Patrushev has been the secretary of the Council since 2008; before that he headed the Federal Security Service. The Council has a website and office address, but no press spokesman, no email address, and no telephone number. Exactly why such a silent, professionally cautious group should be so careless as to advertise publicly that they are negotiating a large arms sale to Libya to help the government in Tripoli put down the local opposition is inexplicable – unless they were testing the Libyans to prove they can deliver what the Kremlin wants from that benighted place. Did they fail to anticipate the outcome might be an armed attack on the Russian Embassy in Tripoli, and the forced evacuation of the embassy staff? Read on. Rogozin added that one condition of a new arms deal with Tripoli was the revival of the contracts signed with the previous Libyan government of Muammar Qaddafi. The contracts of January 2010 included the delivery of combat aircraft, upgrades of Soviet-era tanks, various types of missiles for air and surface operations, and infantry vehicles. Those contracts came with a prior condition. In 2008 the Kremlin had agreed with Qaddafi to forgive $4.5 billion in Soviet-era debt owed for an earlier generation of arms deliveries. That was roughly half the value which Russian Finance Ministry officials had estimated to be Libya’s debt as of 1991. What has happened to the rest of the debt is also in the Top Secret box; the Finance Ministry won’t say. The murder of Qaddafi and the regime change don’t qualify the successor government in Tripoli to revoke all debts and obligations, nor have Libyan officials dared to suggest this. So the Russian arms exporters have pressed on with the deal Rogozin had announced publicly, letting cats out of the bag in their apparent enthusiasm. In May of this year, Sergei Chemezov, head of the Russian Technologies (Rostek) which includes Rosoboronexport, told RIA-Novosti that he had met a high-ranking Libyan official and received from him a request for a big arms deal. Chemezov looks calm in the picture (right). The Libyan, he claimed, was more excitable, coming from behind the palm tree and slipping him a top secret letter for Putin. Chemezov and the Libyan had been together at the ceremonial commissioning of a factory in Jordan, which is to assemble Russian-made grenade launchers. According to Chemezov’s calculated press leak, the Libyan representative had asked him “to hand a letter to our president, that they would like to buy something and will apparently send a delegation to discuss their request.” Chemezov wanted the world to know more — for example, that this wasn’t the first such approach. “They have already asked us, as far as possible, to revive contracts that were suspended,” he added, claiming the negotiations had yet to begin. That was on May 31. 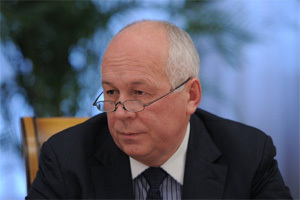 Chemezov isn’t a member of the Security Council, but it’s certain Putin passed the Libyan letter to Patrushev and asked for a Council staff review, with recommendations of what to do about the Libyan request. Putin asked Patrushev to be sure to include in his memorandum whether the Libyan government was stable and trustworthy enough to honour their signatures if new contracts were agreed. In the Council’s Top-Secret box there were also Russian foreign intelligence reports of what the various Libyan militia groups were up to, including Chechen fighters who have drifted out of Russia to pick up Saudi salaries for making war elsewhere, and keeping in shooting form before the Saudis order them back into the Caucasus. Then Lavrov let the Rogozin-Chemezov cat out of the bag again. “We outlined good prospects of further development of military and technical cooperation, including supplies of armaments and necessary equipment, as well as preparation of staff for the Libyan army and police. We also discussed potential projects, which will help our Libyan friends to strengthen cross-border security.” For cross-border security in Russian, read Chechens. Lavrov wasn’t obliged to say so much, any more than the Security Council was forced to agree to letting Abdulaziz and his delegation come to Moscow in September. There are plenty of civil sector projects in Libya which Russia has an interest in reviving, so Lavrov could have restrained himself in his public remarks and avoided mentioning arms. So why did he go to the trouble of advertising for the third time that the Libyans want to buy Russian weapons? Lavrov isn’t a policy initiator; he’s good at taking instructions from all sorts of people. Was he, a member of the Security Council, reading from the Council script agreed beforehand with Putin, intentionally letting those the arms are intended to be used against – “cross-border security” – know what is coming for them? Since when is telegraphing a punch a feature of Russian state security, foreign diplomacy, and modus operandi for the SVR? — Rogozin was asked to clarify his advertisement of arms sales to Libya, but he refuses to say. According to his spokesman, Nikita Anisimov, he can’t get hold of his boss and can’t say a word on anything until Rogozin returns from a business trip next week. At Rosoboronexport Chemezov’s spokesman, Alexei Ventslovskiy, passed the buck, saying questions about Chemezov’s dealings with the Libyans should go to Rostek for answer. Yuliya Lebedinskaya, the Rostek spokesman, says that she received this correspondent’s letter as surely as Chemezov had received the Libyan letter to Putin. 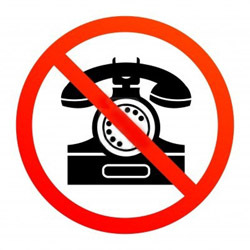 But Rostek is refusing to answer. “We are not going to answer of course, because this occasion was announced after a meeting with the Jordanian side at the end of May. So half a year has passed and [comment] on any details is inappropriate.” Ventslovskiy promises to telephone to confirm whether Chemezov feels up to saying more about Libyan arms sales than he did last May. This is what you would expect when sensitive gun-running matters are on the table for discussion. But the silence of the Russian officials has another context. Not the public disclosures of guns for Libya which stretched back over eighteen months, but the attacks on the Russian Embassy in Tripoli which almost cost the lives of the Russian ambassador and his staff. These attacks started on October 2, just three weeks after Lavrov hosted Abdulaziz in Moscow. For what happened – that’s to say, what Lavrov’s spokesman, Alexander Lukashevich, wants you to think happened — the Russian press reports claim the cause was a Russian lady running amok, killing her Libyan husband and wounding her mother-in-law on October 1, the day before the embassy was invaded by a gun-toting mob. In unusual detail it has been claimed that Yekaterina Ustyuzhaninova, a bench-press, weight-lifting champion from Novosibirsk, was the perpetrator; whether she was arrested and in the custody of the Libyan police at the time of the embassy attack; or whether she had taken refuge in the embassy, isn’t clear. Ustyuzhaninova is also reported as having taken part in protests against the Anglo-American campaign to overthrow Qaddafi in 2011. What that has to do with the circumstances of her alleged attack this month on her husband and mother-in-law, two years since Qaddafi was assassinated, is unknown. Why the mob would go to the embassy building instead of the police station to demonstrate what they thought of Ustyuzhaninova is also uncertain. Lukashevich didn’t mince words; he also didn’t recommend any qualification in interpreting the events in Tripoli. The attackers, he said, were an “armed group of militants”. They were reacting to Ustyuzhaninova’s crimes, which were “the direct reason for these aggressive actions”. 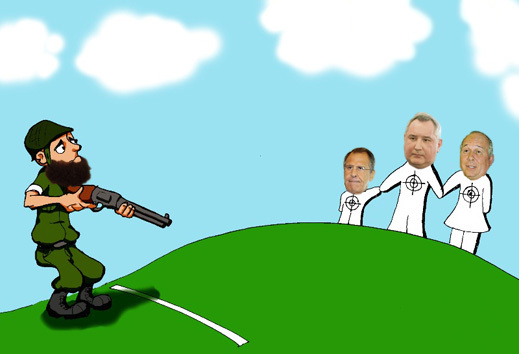 Maybe this is what Rogozin, Chemezov and Lavrov are hoping is the truth of the matter. For if it turns out that the “armed group of militants” who shot up the embassy were in fact demonstrating their readiness to stop Russian arms dealings with the Libyan government, then how is it possible the three Russian leaders failed to anticipate the impact of their press leaks? Not likely — not possible — not so soon after another incident of calculated press leaking, also in relation to a sensitive Arab gun-running matter, and to the operation of Chechen fighters in Arab employment. The earlier incident surfaced as the purported transcript of a meeting in Moscow at the end of July between Putin and the head of Saudi intelligence, Prince Bandar bin Sultan. The Kremlin communique of July 31 is as circumspect as you would expect when intelligence matters are on the table. Then on August 21, in Arabic translation of what had been published in Russian, followed by English, excerpts of what Bandar threatened, er, said to Putin, appeared. The Russians know Bandar to be a scheming character, who has attempted many times before to expand his power over his royal relatives, compensating for his mother’s origin as a slave with intelligence staffs, military plots, and money to finance islamist armies and regime change. His personal corruption has also been reported in the London press. A Saudi source in a position to know recognizes the reported remarks from Bandar as typical of his self-promotion, which he is obliged to restrain at home. That the remarks were leaked by the Russian side will not have much impact on his reputation with the Saudi leadership, or with his American sponsors, the source believes. 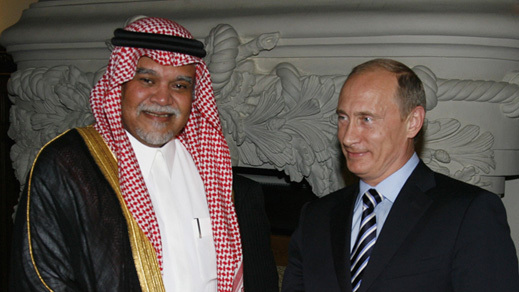 But it has ended Bandar’s belief in his own value as a channel of communication between Riyadh and Moscow. Can the Libyan leaks from Rogozin, Chemezov, and most recently Lavrov, have been a test of Abdulaziz’s bona fides, or are they intended to undermine the already parlous position of the Libyan government? As for Russian commercial interests in Libya, Gazpromneft says it wants to buy a position in the Project Elephant oilfield from the Italian operator ENI, but completion of that transaction depends on the Italians completing project arrangements with the Libyan government. Tatneft won’t say more than it has already conceded this year on whether it will resume operations at the Ghadames oilfield it evacuated during the NATO intervention.